How you can help the South Dakota FFA Foundation, Inc. The following specific divisions allow businesses, individuals and chapters to invest in Agricultural Education. Simply contact Gerri Ann Eide at the SD FFA Foundation if you wish to partner with us to meet our goals, or print and mail our contribution form. 2. Sponsored Project - For donors who wish to sponsor specific projects or awards programs such as agricultural proficiency awards, career development events, agri-science, community development, safety activities and leadership training. 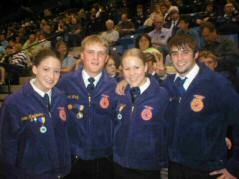 Another example would be sponsoring an FFA jacket through our Blue Jackets Bright Futures FFA Jacket program. 3. Planned Giving - Ensure that the future is bright for young leaders in agricultural education with a planned gift. Many of these have wonderful benefits for the gift donors. Consider leaving a Legacy Gift through the SD FFA Foundation. 4. The Star Partner Program - The purpose of the Star Partner Program is to promote those businesses and organizations supporting the longevity of the SD Team Ag Ed program through their sponsorship.